Got zucchini? We’ve got recipes. This isn’t a recipe that was created off the weekend trip to the farm; rather it’s a recipe from the Think Tasty archives, back in the days of yore when I could get zucchini with a quick five minute walk to the local stand. However, it felt like the perfect Friday Flashback, as it is another recipe that utilizes fresh produce in a simple way. After you’ve tried using it all of the typical ways and think you can’t stand another bite, you’ll be surprised to see that there may be a way after all. 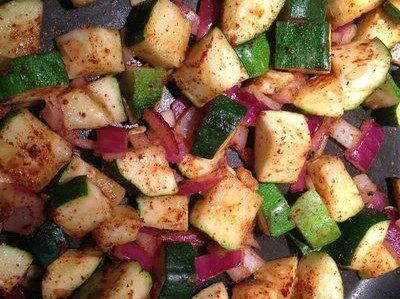 This recipe for Mexican Zucchini will bring a new dimension of flavor to the veggie without a lot of effort. Bye bye, boring zucchini. Hello, new and interesting! Whether you serve it as a tapas dish with the Mexican Corn Off the Cob or just as a side with whatever meat you’re grilling that night, it will be a delightful change of pace. Feel free to up the amount of chili powder or add some hot sauce for extra kick. However you serve it, this zucchini surely won’t feel like the same old veggie.